Life's Journey To Perfection: 2x4 Heart Picture Holder: A Great Gift For Valentine's Day. 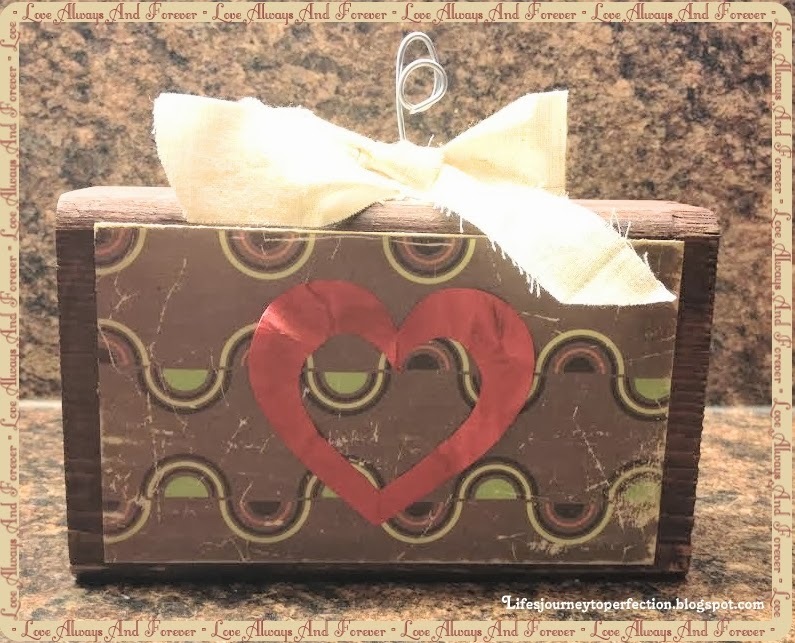 2x4 Heart Picture Holder: A Great Gift For Valentine's Day. This is a very simple craft that even the kids could help with. Cut your block of wood 5-6 inches long. Lightly sand the edges. The one above, I was in a hurry so I did not sand it at all (it just gives it a rustic feel). Now, paint the back and all of the edges and about 1/2 inch onto the front in a color that coordinates with your scrapbook paper. After the paint dries, cut a piece of scrapbook paper to the size of the block. I did mine a little smaller than the block. Then mod podge the scrapbook paper onto the front of the wood. Next, cut out your heart. I just did the good old fold the paper in-half and cut out half of the heart on the fold. Then I cut a smaller heart out of the middle. Then you crumple the paper up, un-crumple it, and give it a distressed look using ink. Apply mod podge onto the back of the heart & put it in the center of the block. I let it have kind of a bubbly look by not letting the whole thing be glued down flat. Next, you will distress the edges of the scrap paper with sand paper or emery board, then ink them. Next step is to poke a hole in the top of the block. To do this use a ruler to find the middle and mark with a pencil. Now, you will either need to drill the hole with a very fine drill bit, or you can do what I did and put a push pin in an pull it back out. For the holders for the pictures you will need to cut some wire and twist it with some small pliers. Then you will insert the straight end into the hole you poked into the top of the block. If it does not fit securely then add some glue. Spray the entire thing with clear coat. Lastly tie a bow out of ribbon or a strip of fabric and hot glue it onto the block, close to the wire. Secure a picture in the wire holder and there you go a simple easy gift to give to your special someone. These also work great as teacher gifts or gifts to grandparents. If you have any questions about this project, please leave me a comment below. Or you can email me at lifesjourneytoperfection@gmail.com.